Date: Apr 6 2019, 12 a.m. - 11:59 p.m. This is a comprehensive introduction to alpine/glacier mountaineering. 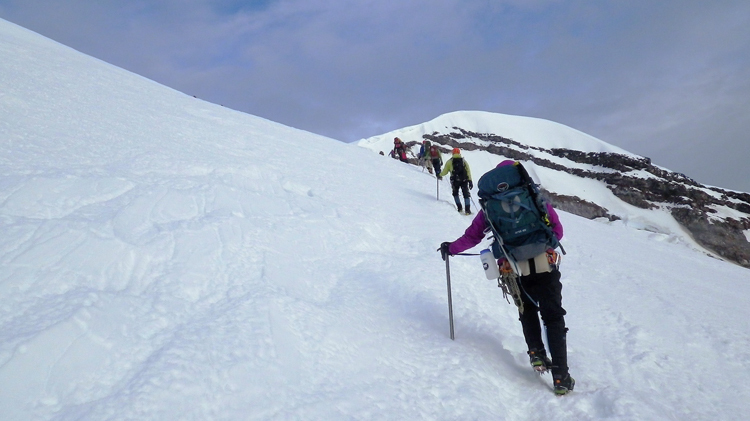 Graduates will develop the fundamentals skills necessary to climb alpine and glacier peaks wherever your travels take you. We will cover knots, anchors, glacier travel, the fundamentals of self and crevasse rescue and touch on alpine rock, belaying and rappelling. The course runs over a few months with four, mid-week hands-on lectures and one overnight field trip. Attendance at all lectures and field trips are required for graduation. Participants should be in good cardiovascular shape and be comfortable with basic camping skills. Outdoor Rec offers an intimate learning experience with well-trained instructors. Although the course is demanding, the rewards are great. The acquisition of these skills opens the door to a lifetime of outdoor enjoyment. Course graduates are eligible to participate in Basic Climbs, Club Climbs, the Intermediate Climbing Course, and other advanced climbing seminars and clinics periodically offered by the outdoor recreation. The climbing course involves a commitment of time, both in and out of the scheduled classes and field trips to learn about mountaineering.